Oil on panel, 30 x 28 cm. 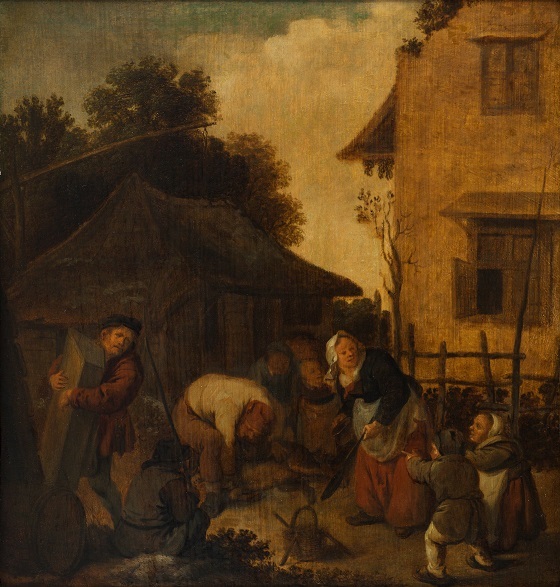 The painting depicts a tumultuous scene taking place among peasants in a rural setting. The focal event is the slaughtering of a pig taking place in a backyard. A peasant in a white shirt and red hat is in the process of stabbing the pig, while the wife, standing in a waiting position, attempts to collect the blood. A recurring element in Jan Miense Molenaer’s everyday depictions of rural life is the underlying symbolism which often relates to moral dogmas. In Molenaer’s time, it was traditional to slaughter animals and cure and save the meat for the coming winter. His depiction of the slaughtering of a pig may accordingly be a symbol of wisdom and sensibility as moral virtues. This kind of symbolism was not unknown at the time; in fact it dates back to Pieter Brueghel the Elder’s etchings of the seven Christian virtues, where the slaughter of animals, curing meat and other winter preparations comprise the allegoric portrayal of the virtue of wisdom.